For price and discount information call 020 3404 0500 or use the online contact form here. We will give you a totally free carpet cleaning price quote 24/7. Our professional carpet and rug cleaning service begins with thorough hoovering and a detailed inspection of the carpet by our skilled cleaner. Any cleaning solutions which will be used are tested on a hidden small area on the carpet for a possible negative reaction. Removable stains are all pre-treated with the suitable solutions. Then either shampoo carpet cleaning with a hot water extraction machine or professional dry cleaning is performed by the cleaner with the help of modern cleaning solutions, machines and tools. If you want, our cleaner can apply Scotchgard after that, or can provide you with completely safe and highly efficient carpet or rug deodorising. 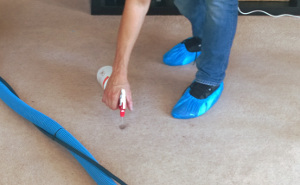 We provide the people and business owners situated in Havering RM with the highest quality deep carpet cleaning in the area. Excellent Carpet Cleaning has been offering professional steam carpet cleaning and dry foam carpet cleaning for over a decade. All of our cleaners are hand-picked after personal recommendations. They are police background checked, trained and experienced in using our modern professional carpet cleaning equipment, solutions and tools. Our prices are fixed and affordable. We will not charge you extra hidden fees. We can clean any type of carpet or rug, and offer carpet spot and stain removal of various stains, such as: oily stains, paint, rust, tea, blood, wine, coffee, vomit and can repair moth damage on your rug or carpet. We can provide regular or one off carpet and rug cleaning for residential and commercial properties as well. We provide dry foam carpet cleaning or steam carpet cleaning, depending on the type of rug or carpet we are cleaning. After an inspection of the rug or carpet, the cleaner starts with hoovering it to remove as much dust and residues as possible. Any stains which can be removed are pre-treated with suitable stain-removal solutions. We can remove the following types of stains from your carpet or rug: blood, coffee, vomit, rust, tea, paint, wine, oily stains and can even repair moth damage. The heavily soiled areas are also pre-treated before the deep cleaning. After that, the expert cleaner proceeds to deep clean the carpet or rug, by either using a hot water extraction machine to do a deep shampoo carpet cleaning or uses dry cleaning foam to clean the more delicate rugs or carpets. Upon request, we can add deodorising and Scotchgard protection to the cleaning service. The carpet cleaning teams can also provide drapery cleaning, blinds cleaning, curtain cleaning, mattress cleaning and bed bug mattress treatment. If you book one or more extra service, we will give you discounts from our prices of up to 15% for every next service you order. We have made the booking process as simple and quick as possible. Call 020 3404 0500 or send an online booking request here. Our customer service staff will process your request within the next 2 hours and will send you written confirmation. This can be done 24 hours a day. We work Every day, also on public holidays and weekends. Our booking requires no deposit. You can book more than one of the services we offer, and we will reward you with discounts to up to 15% of the price. Regular customers as well as estate agencies and local landlords will get preferential prices for our cleaning services. Book now!